For current pricing on Florida Resident annual passes and all other ticketing media, visit our ticket pricing page. Annual Passholder room discounts of up to 35% for stays 1/1/19 – 4/27/19 and up to 40% for stays 4/28/19 – 6/30/19. Pricing and savings will vary by resort type and date. Rates not available for all dates, room types and resorts. There is no minimum stay with this offer. Book by 4/27/19 for January to April dates and 6/30/19 for April to June dates. As with all Disney promotional discounts, some resorts, room types and date combinations will not be available. You can log on to www.disneyworld.com/passholders and log in to the Passholder’s site where you can make your reservation online or call (407) WDISNEY. You must have an annual pass ticket or a voucher for any one of those to log in. Proof of valid Adult Passholder ID required at check-in. Additional per-adult charges apply for more than two adults per room. 35% savings is for select Disney Deluxe and Deluxe Villa Resorts; lower savings for other Resorts. Annual Passes offer a way to save money if you plan to visit WDW often. Here are the main selections offered. More information on admission options for Florida residents can be found on the Florida Resident Ticket Information page. The Platinum Annual Pass, formerly called the AP, is available to everyone. It entitles you to unlimited admission with park hopping privileges to the 4 Main Parks for 12 months with no blockout dates*. You also get complimentary parking in the theme park lots as well as the passholder benefits listed below on this page. You get a Magic Band and free PhotoPass downloads. Complimentary use of WDW transportation system – monorails, ferryboats, and motor coaches – is included. *Except activities/events separately priced. The Platinum Plus Annual Pass, formerly called the PAP, is available to everyone. It entitles guests to unlimited admission* with park hopping privileges with no blockout dates to the Magic Kingdom® Park; Epcot®; Disney’s Hollywood Studios; Disney’s Animal Kingdom Theme Park; Disney’s water parks: Blizzard Beach, Typhoon Lagoon, Disney’s Oak Trail Golf Course (greens fee only. Tee time reservations are required and subject to availability: 407-WDW-GOLF), and ESPN’s Wide World of Sports complex, as well as complimentary parking in the theme park lots and all the passholder benefits listed below. You get a Magic Band and free PhotoPass downloads. Complimentary use of WDW transportation system – monorails, ferryboats, and motor coaches – is included. *Except activities/events separately priced. In 2000, Walt Disney World changed the Annual Passholder renewal policy. The new policy states that your renewal Annual Pass becomes effective the day after your current Annual Pass expires. Previously, if you renewed by mail, you received a voucher which was not activated until you were at the theme park and traded your voucher in for a new Annual Pass. Now your renewal voucher exchange will be back dated to the expiration date of the previous pass. Disney now has a Passholders only section on their web site where Passholders can log in to view the current information about benefits and renewing as well as view online the most current Mickey Monitor newsletter that has been released. You will need your Annual Pass/SP or voucher in hand when you log in. Disney now offers Florida Residents a way to spread the cost of an annual pass over twelve months. At the time of purchase, you will be required to make a down payment equal to the price of a non-discounted one-day, one-park theme park ticket plus tax (currently ranging from $137.39 for a Magic Kingdom ticket in Peak Season to $116.09 in Value Season). The remaining cost of your select Florida Resident Annual Pass will be split into 12 monthly payments that will be automatically billed to a credit card that you provide. The first monthly payment will be charged on the day that you sign up or shortly thereafter. Balances may be paid off at any time. The purchaser must be able to provide valid proof of Florida Residency and be at least 18 years of age. Passes can be purchased under the Monthly Payment program online or in person at a Walt Disney World Theme Park Ticket Window or any Guest Relations location. The Monthly Payment program is not available for Pass purchases on the phone. This payment plan is available for the following Florida Resident tickets: Annual Pass, Premium Annual Pass, Seasonal Pass, Weekday Select Pass and the Epcot After 4 Pass. Where can I buy Annual Passes (AP’s) and Platinum Plus Annual Passes? – from DVC Member Services (DVC members only) (mailing fee of $5 required). Annual Passes can also be put on “will call” at no additional charge when ordered through the web site, 407-WDISNEY or DVC Member Services. I hear there is a new policy on purchasing Annual Passes. What is it? On October 2, 2000 Disney changed their policy on Annual Passes. Any AP purchased at WDW now receives an activated pass, not a voucher. (NOTE: vouchers may be purchased by request at any of the Guest Relations locations at WDW.) This pass will expire one year from the date of purchase, not the previous one year from first use. The date of expiration is clearly printed with the words “Expires on” on the AP itself. If you purchased the AP from any other source (The Disney Store, online or by phone from WDW, the Disney shops at Orlando International Airport, or any of the Florida mall locations) and it doesn’t have the word “Expire” (or any form of the word) on it….then it is not an admission media with the clock ticking. It is a voucher which must be exchanged at WDW Guest Relations for the activated pass. Most vouchers are a bright yellow/green color. Your one year will start upon exchanging the voucher. I purchased my Annual Pass from The Disney Store. Is this the real pass or a voucher? Though it may be printed on hard plastic credit card material, what you receive from the Disney Store is a voucher and not an AP itself. Once you get on property, you will want to activate your Annual Pass (and therefore start the one year from *that* time). And don’t get too used to the hard plastic card. You will get the mylar paper ticket stock for your activated AP. NOTE: In January 2006, select Disney Stores resumed carrying AP vouchers. I want to buy an AP now for financial reasons but my trip is still 18 months away. Will my voucher expire before I can use it? Not likely. There is now a 2030 expiration date on new AP vouchers. They can be exchanged for an active AP at no additional charge from when you purchased it. And in the rare event that you still have your voucher after the expiration date, its status becomes like that of a gift card. You would no longer be able to exchanged it for a new AP but you can apply the money that you originally paid for the voucher towards a new AP at the then prevailing price. Older AP vouchers have no expiration date. People have reported activating vouchers that were as old as five years. But there has been a change in the policy regarding any renewal vouchers still outstanding from the days when your renewal didn’t start until you exchanged the voucher. Unless you have had an active AP within the previous 12 months from the date you want to activate it, Disney will no longer consider these to be a renewal when you go to exchange them. You will have to pay the difference in price between the cost of the old renewal voucher and a current new (not renewal) AP. Where and how do I activate the voucher? To activate the voucher, turn the voucher and a photo ID into the Guest Relations window at either the Magic Kingdom, Epcot (either front or International Gateway side), Disney’s Hollywood Studios, the Animal Kingdom, Typhoon Lagoon, Blizzard Beach or the Guest Relations office at Disney Springs. You cannot activate your voucher at a WDW resort Lobby Concierge. You can now purchase a new AP or activate the voucher at any WDW major park ticket sales location, not just at Guest Relations. This may be a good option if you’re doing this at off peak times of the day. It may still be a good bet to use Guest Relations during the park opening rush. A word of caution: There have been reports of people turning in their vouchers and getting activated AP’s with the wrong expiration date on them. The passes will have the date you bought the voucher rather than the date you turned it in. Always check your passes for accuracy before you walk away from the Guest Relations window. It will avoid major problems for you later on. My AP says it expires on 7/11/2018. Does that mean that I can use it on that day? Yes you can. The wording on the pass is actually “valid through 7/11/2018”. All new (non-renewed) Annual Passes are actually valid for 366 days from the date you actually activate the voucher or purchase it at WDW. How long will it take me to activate my voucher or buy a new AP at the ticket window or Guest Relations? The exchange of a voucher or purchase of a new Annual Pass will usually take about 5-10 minutes. A photo ID is required for identification for each adult and if you purchased a DVC annual pass, you need your blue DVC card. I know I can buy AP’s at the Orlando Airport Disney shops. Does that mean that I can activate my Annual Pass voucher there, too? No you can’t. The airport shops are not run by Guest Relations. Think of them more in terms of an upscale Disney Store. Even the AP’s they sell there now are vouchers, not activated passes. I have an Annual Pass and just received a letter in the mail asking if I want to renew it. I do, but won’t be back at WDW for several months yet. How does this work, I don’t want to activate it before I go. When you renew your Annual Pass, it starts the day your old one ended. So if your pass expires April 10, 2018 and renew it; the new one begins April 11, 2018. It no longer gets activated when you first use it. Therefore, if you are not returning to WDW for a while, you need to consider if renewing your pass is financially your best option. It might make more sense to you, to wait and just start a brand new one on your next visit. The 30 day renewal window you used to get to renew an Annual Pass after it expired was discontinued in October, 2000. You had to renew by your expiration date to get the renewal rate. Your renewed pass began the day after the old one expires. But the advent of Magic Your Way tickets in 2005 saw the return of the 30 day renewal window with the pass being backdated to the previous expiration. The fact is that the Guest Relations cast member has great latitude in doing this and can even extend the window past 30 days in some cases. I have an Annual Pass and haven’t received a renewal letter. What can I do about renewing? Annual Passes can also be renewed in person at any major park Guest Relations windows, park ticket booth or at the Disney Springs Guest Relations office. My boyfriend/girlfriend/best friend/significant other has an AP that needs to be renewed at the same time as mine. Can I renew it for them? Yes, as long you have his/her name and address, or Pass code information (found on the bottom of the back of the Pass; consists of the whole bottom line). I heard something about finger scans for Annual Passes. What is that about? With all Disney tickets, the turnstile CM will request you to lay a finger onto a device that will first record and later compare your *biometric scan*. Disney calls this “ticket tagging”. The biometrics units take a series of photographs of your finger – it measures your finger and compares that each time your pass is used. If your pass stops ‘working’ a few times in a row, ask the CM to take a new reading for future use. The finger biometrics are used on all adult Annual Passes sold to ages 10 and up. Children under 10 with a child’s Annual Pass do not use the finger scans. They merely insert their pass and go through. A more complete explanation of the turnstile finger scanning system can be found on our finger scan page. What happens if I buy a child’s AP for my 9 year old and then he/she turns 10 before the AP expires? You won’t need to do anything. Disney will allow your child to continue using the child’s AP until it expires. Any subsequent renewals will be done at the adult price. If you or your child insist on having the pass changed, Guest Relations will exchange the child’s AP for an adult one at no extra charge. This follows the same policy they use for this situation in any ticket media. I have heard that I can upgrade my regular Theme Park ticket to an Annual Pass and get full credit for the original purchase price even after I have used a few days admission. Is this true? Yes it is. If you decide that you want to upgrade it to an Annual Pass, you will get full credit for the price of the ticket towards the Annual Pass. All regular Theme Park tickets must be upgraded within 14 days of first use. In all cases, the Annual Pass will be backdated to the date the hopper pass was first used. Tickets purchased prior to the introduction of Magic Your Way tickets can still be upgraded but must be completely unused to do so. But beware: If you get a Theme Park ticket with the Park Hopper Plus option and use one of the minor park admissions (water parks, Oak Ridge Golf or Wide World of Sports) admissions before doing this, you will only be allowed to upgrade to a Platinum Plus Annual Pass. What if I decide I want to change to a Platinum Plus Annual Pass after I already used my AP? You can do this. It will be handled just like any other pass upgrade. There was a time that you could upgrade your AP to a Platinum Plus Annual Pass simply by paying the prorated difference on the remaining time of your AP but no more. Disney will no longer pro-rate an AP for this. If you want to upgrade an AP to a Platinum Plus Annual Pass now you will be charged the full price difference between the two for whatever time you have remaining on the AP. If I realize after purchasing or upgrading to a Platinum Plus Annual Pass that I’m not going to use the water parks admissions very much, can I downgrade it to a regular AP? No you cannot. Disney does not allow downgrading on any current pass. You would be allowed to downgrade from a Platinum Plus Annual Pass to an AP upon renewing an expiring pass however. No you don’t. You can call and book the rates without having the Annual Pass in hand. However, if you want to use Disney’s Passholder web site to book at the AP rate online, you will need either an active AP or a voucher to do it. The policy about having it at the time of resort check in is clear as mud. Some people have been allowed to obtain the rate at check in with only their Annual Pass voucher. Others have been told to return to the resort front desk to show the desk CM after activating the pass. Still others have not been asked for any Annual Pass at all. The official Disney policy states an activated adult Annual Pass pass is needed at check in.You may want to avoid any potential embarrassment at check in by having an activated pass at that time. If I am an AP holder, can I book more than one room at the AP rate? You may book three rooms per passholder. Is there a way to get a discount on the price of an AP? The only current discounts Disney offers on purchasing Annual Passes are the Florida resident discount, the Cast Member discount, the DVC member discount and the military discount which is only offered through Shades of Green and onsite at military installations. See our Ticket Chart page for current prices. I put my AP away somewhere to keep it safe and now I can’t find it. Does that mean I’m out hundreds of dollars? –OR– I have ruined my Annual Pass by putting it in the washing machine. What can I do to get it replaced? If it was an activated Annual Pass, you have no problem. Simply bring your photo ID to any Guest Relations location and they will reissue your Annual Pass to you. If you have misplaced a new unactivated Annual Pass voucher, then you have a bigger problem. There is no buyer identification associated with a voucher. It can be exchanged and used by anyone. Your best protection from this is to make a photocopy of the back of your voucher as well as a photocopy of the sales slip and keep them where you would keep other valuable personal papers like insurance policies or bank books. You will have to prove two things to Disney in order to get it replaced: that the voucher actually existed and that you were the one that owned it. (2) = Block Out Dates: December 20, 2018 – January 3, 2019; April 13-26; June 3 – August 8, 2019. (3) = Block Out Dates: 2018: October 6, 7, 13, 14, 20, 21, 27, 28; November 3, 4, 10, 11, 17, 18, 24, 25; December 1, 2, 8, 9, 15, 16; December 20-31.
Who can get these discounted passes? Disney Vacation Club Members and their immediate family living in the same household will receive discounts on select new and renewed Walt Disney World Annual and Premium Annual Passes. Limit 8 purchases per household. Are all members of the DVC Member’s immediate family included in the offer? The discount is available to DVC Members to purchase Passes for themselves and their immediate family living in the same household. Who is defined as “immediate family”? 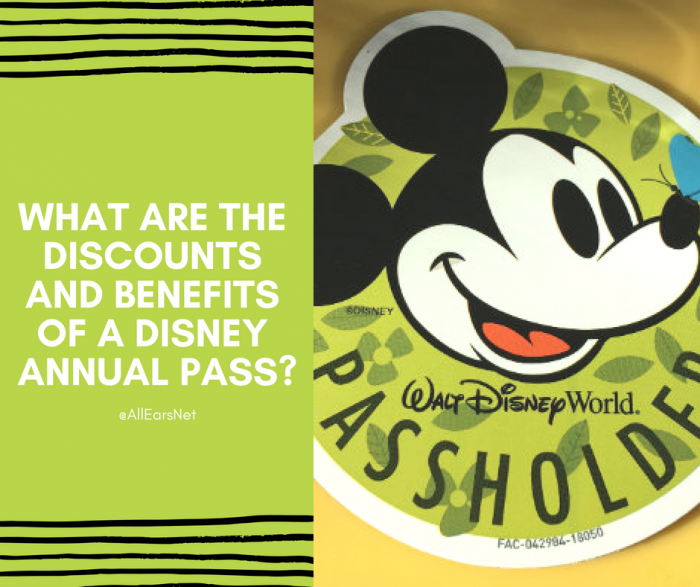 Can I use my discount to buy an Annual Pass or Premium Annual Pass for someone other than myself or immediate family residing in the same household? No. This discount is exclusively for Members to purchase for themselves or immediate family residing in the same household and may not be transferred. This benefit may be revoked in the event of abuse. What stops me from saying someone lives with me when they don’t? All adults must present a valid driver’s license or state identification card showing they reside in the same household. Will this offer be available for Annual Pass or Premium Annual Pass Renewals also? Yes. Member Services and Guest Relations at the Theme Parks and Disney Springs will process any renewals at the discount. Where can I get these DVC discounted passes? Passes can be purchased online by visiting http://dvcmember.com, by calling Member Services or at any Guest Relations location at all Theme and Water Parks and Disney Springs. These tickets will not be available at any Resort Lobby Concierge locations. If purchased via http://dvcmember.com or Member Services, Members will receive an Exchange Certificate Voucher. If purchased on-site at Guest Relations, Members will receive the activated Annual or Premium Annual Pass. Disney Vacation Club Member ID cards must be provided at the time of purchase and/or Exchange Certificate Voucher redemption. To enjoy your 2019 Passholder benefits, you must present your valid annual pass – along with a valid photo ID – at the time of purchase, booking, and/or redemption of any offers. Offers may not be combined with any other certificate, offer or discount. Offers apply to the Passholder only, unless otherwise noted. Offers are subject to change without notice and are subject to availability. 2018 Passholder benefits expire on December 31, 2019. These benefits apply to all pass types purchased during 2019. Blockout dates apply for Disney Gold Pass, Disney Silver Pass, Disney Weekday Select Pass or Seasonal Pass. As of late 9, Passholders now have access to a new dedicated service—V.I.PASSHOLDER SUPPORT—to answer questions, explain Passholder benefits and provide helpful recommendations through the Passholder phone line and the new online chat and email support. — Phone – Call (407)-WDW-PASS or (407) 939-7277 for assistance 7 days a week from 7 a.m. to 11 p.m. Eastern Time. — Email – Visit Disneyworld.com/PassholderHelp and fill out a short form. — Already in one of the parks? Stop by the Liberty Square Ticket Office in Magic Kingdom, Ticket Central at Disney’s Hollywood Studios or Ticket Corner at Disney’s Animal Kingdom to speak with a Cast Member. You can also find useful information on Facebook @DisneyWorldPassholders. Passholder Newsletter: Mailed four times per year (Feb., May, Aug., Nov.), the “Mickey Monitor” newsletter highlights the latest information on new attractions, upcoming events, Passholder offers and discounts. (U.S. and Puerto Rico only) Also available online in the Passholder section of the Disney web site. Complimentary parking: Annual Pass holders are entitled to free standard parking at the MK, Epcot, DHS and AK parking lots. Free parking is not valid for special events requiring a separate admission charge or special events that are not open to the general public. Passholders can purchase a discounted Tables in Wonderland membership for $150. To purchase a membership, please visit Guest Relations at any of the 4 Walt Disney World theme parks or at Disney Springs. Annual Passholders may also purchase by phone by calling (407) 566-5858. Guests under 18 years of age must have parent or guardian permission to call. Please allow 3 to 4 weeks for delivery when purchasing by phone. When purchasing in person, please be sure to bring a valid photo ID and your annual pass. Special Resort Rates – From time to time, special offers for discounted rooms at select Disney Resort hotels are available for Passholders. Please visit Passholder Resort Special Offers or see your Mickey Monitor newsletter for more information. Annual Passholders can get discounts at a wide range of things ranging from bike and boat rentals to massages. Annual Passholders can get discounts on things like water park tickets, park tours and more. HAVE YOU MOVED AND WANT TO CONTINUE RECEIVING MICKEY MONITOR?? – Please call 407-560-7277 and have ready the following information: Name of all Passholders in the Household; Pass Type and Number (found on the pass), Pass expiration date; Old address, New address and phone number.